A small space can still make a big impact. "We've got a large lot but not a huge budget. Should we start our landscaping with the front yard or the back?" Kelly, the short, and probably unhelpful, answer is: it depends. I wrote a while back about the psychological differences between front and back yards, which boils down to this: your front yard is your "public" face, while your back yard is your "private" space. Determining which is more important to you will be the first step in making your decision. Your landscape designer should have some way of helping you prioritize what you will want and need from your new garden spaces. Sometimes this is done with a simple questionnaire; these are usually good for helping determine the functionalities your yard will need to support (e.g. a vegetable garden or swing set), or "macro" preferences such as favorite colors. However, often they ask you for answers you just don't know yet (isn't it the designer's job to help you determine whether your soil is compacted?). Other times, the designer delves a little deeper to find out what a garden means to you, not just what parts you envision it containing. The intimacy of this approach can yield powerful results: scents that return you to the best memories of your life, symbols and metaphors that inspire you, and perhaps just as importantly, an awareness of elements that will be best avoided. One crucial consideration to which you've already alluded is your budget. The good designer is a steward of your money — our job is to help fulfill as many of your most important wishes as possible with the money you have. (For that reason, it's important to not understate your budget: our designs can only be as good as the information we're given.) In your case, you might have two options: develop the entire property to a lower level of finish (e.g. 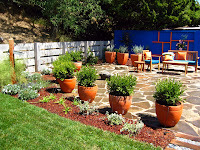 using concrete for a patio instead of natural stone), or develop one area of the property at a time. In the latter option, my approach would be to develop a master design concept for the entire property, then develop more detailed plans for the areas that are most important to you now. So if you know you'll want an outdoor dining room for entertaining, we'll focus on that area and its related spaces first — but we won't lose sight of the bigger picture in the meantime, and can pick up where we left off when you have the budget to develop your second most important area. What's more, this gives your contractor a sense of the ultimate plan for the landscape as well, which may allow them to help you realize some efficiencies in construction (e.g. placing conduit beneath hardscaping for future landscape lighting, or installing capped irrigation lines for future planting areas). It's been my experience that most contractors are also happy to discuss the potential costs and phasing of master concepts, and to offer ideas to make sure you'll actually be able to afford those brilliant ideas. It sounds obvious, but ultimately you're the one living with your yard day after day. Figure out what spaces absolutely must be transformed to improve the quality of your life at home — maybe a beautiful approach to your front door is more important that that dining space after all — and you'll be well on your way to knowing how to spend your money most wisely. Today's edition of Forum on KQED featured a most informative discussion of the Light Brown Apple Moth, and the recent announcement of California's plans to spray pesticide to eradicate it. In other news, yesterday's edition of Fresh Air featured a most informative interview with the author of Banana: "a primer on the expansive history — and the endangered future — of this seedless, sexless fruit." If you have children of a certain age, over the next couple of days you'll be inundated with kitschy little valentines bearing various Pixar and Disney characters — and you'll be under pressure to reciprocate. We're in the same boat (x2), but I'm drawing my line in the sand. Instead of perpetuating the waste of perfectly good paper (i.e. trees), we're giving valentines of homemade seed packets. and a mix of California wildflowers, which are redundant with some of the above but also include other surprises. We sealed the bag with a little foam sticker (OK, so we're not totally green here) and each packet goes into the schoolmates' mailboxes with a note that says "Plant Me!" The total cost was about $2/packet, which beats most pre-packaged seeds and has a lot more character to boot. I figure, hey, the worst that can happen is the seed packet goes in the trash; and to my mind, better some seeds than a cartoon-branded tree. Amazon.com is selling live plants. On the other hand, at $89.98 + $41.49 shipping for a five-gallon specimen, they're probably not selling many. On the other other hand, if you or your landscape pro can't find a one-gallon lavender Lantana at your local nursery, maybe you deserve to pay $42.47. Realizing that I tend to talk about the state of our world just as much as actual garden design, I hereby rename this blog "A Verdant Life." After all, aren't you reading this because nature makes your existence more rich and joyful? And if I do my work here well, you'll notice the wonders of the world around us just a little bit more... be inspired to make your corner of the planet just a little greener... and live a verdant life both in and out of the garden. I just discovered that my first "Landscape Smart" show is airing in reruns on HGTV this week, and in high-definition no less! The HD episodes seem to be repeating about every three hours today; and the low-def throwback version will repeat on Sunday, February 10, at 8:30 a.m. ET/PT. Also, in case you missed my thrilling victory on HGTV's Landscaper's Challenge a couple of months ago, it will air again next Sunday, February 17, at 9:30 a.m. ET/PT. Set your TiVo, brew a good pot of coffee, and let me know how you like the work!